Over the weekend, I was back at Kitt Peak, taking more images for our big survey. Things weren't too exciting, because it takes a lot of data processing to know if there is an interesting star in any given patch of sky. For me, it's always a little frustrating to come away from the telescope and not be certain what we may have accomplished. But, we made progress. We have now taken pictures of 1700 square degrees, which is about 1/25th of the entire sky, or 1/12 of the sky visible at any one time. That's quite a bit! Our ultimate goal is 5000 square degrees, so we are about 1/3 of the way done. That's a good start, but with the rare objects we're looking for, it's not enough. Yesterday, I was talking with a colleague when another astronomer stopped by, poked his head in the door, and whispered worriedly, "Stern is out. Weiler is back in." My colleague's face fell. This seemingly cryptic quote referred to a staff change at NASA yesterday, when the Associate Administrator for NASA's Science Directorate, Dr. Alan Stern, resigned abruptly. His temporary replacement is Dr. Edward Weiler, presently head of NASA's Goddard Space Flight Center. Dr. Stern took the job as head of NASA's Science Directorate (the people in charge of robotic space probes, space telescopes, and other non-human outer space science at NASA) just a year ago. Stern quickly endeared himself to many of us by giving a series of town hall-style meetings and making changes to details of NASA funding that most people seemed to think were positive. To have him leave suddenly is therefore quite a shock to many people. I am not a NASA insider, and since very little of my funding comes through NASA, I've paid little attention to their policies and future projections. I try to stay informed, but I'm not a NASA policy junkie. Many of my colleagues, especially those with lots of NASA funding, understandably are quite tuned in to NASA. And they seem worried by this development. Why did Stern resign? I really don't know. The resignation came a few days after a flap over funding for the Mars Rovers, and there have been some tough decisions that have been made or were about to be made regarding Mars exploration missions. Or maybe Stern just didn't fit in to the very political climate that exists at the upper echelons of any governmental organization. Or perhaps Stern's vision for NASA science didn't fit in with that of the Administrator (Michael Griffin) and that of the Bush administration (NASA's ultimate boss). Of course, rumors (many contradictory), speculation, and conspiracy theories are already flying around. For most of us, we really don't know what this change may mean. But, if you like political intrigue and are tired of following the presidential campaign, maybe NASA will be able to give you a fix over the next few weeks. As I started describing yesterday, gamma ray bursts are mysterious flashes of gamma ray radiation from deep space. There are two types of gamma ray bursts: the short bursts, which last less than a second or so and have very energetic gamma rays, and the long bursts (up to a minute long) that have less energetic gamma rays. Up until the late 1990s, there were a plethora of explanations for these gamma ray bursts, but not a lot of observational data. The big change started in the late 1990s with the launch of href="http://bepposax.gsfc.nasa.gov/bepposax">BeppoSAX, an Italian X-ray satellite. This satellite could detect gamma ray bursts and then turn and point X-ray imagers at the burst. This allowed the position of the burst to be determined to within a few arcminutes (about 10% of a degree in size), whereas before we only knew the positions of gamma ray bursts to within a few degrees, or an area of sky 30 times the size of the full moon! Coordinates accurate to a few arcminutes are good enough to try looking for the source of the gamma ray bursts in visible light using giant telescopes (which typically can only see an area of a few arcminutes in size). And, when astronomers started to do this, they detected optical light from the gamma ray bursts, but only the long gamma ray bursts. Further study found that these gamma ray bursts were happening in distant galaxies most of the way across the Universe, and that these galaxies were almost always making new stars at tremendous rates. This was a crucial find, as it tells us that the sources of gamma ray bursts come from young stars but not from old stars. And there is one other astronomical explosion with the same characteristic: supernova explosions. One clinching piece of evidence came in 1998, when a nearby gamma ray burst was discovered, and after the optical light from the burst faded, a supernova appeared in the same spot. So, it seems that gamma ray bursts are linked to supernovae. The best current idea is that the entire system starts out as a star tens of times more massive than the sun. These giant stars burn up all their fuel in just a few million years, and end up with a core of iron more massive than our own sun. The special thing about iron is that there is no way to get more energy out of iron by nuclear fusion -- it is the ultimate ash. But it is the energy from nuclear fusion that keeps gravity from collapsing the star. Without that pressure from energy, the star collapses in on itself, forming a black hole at the middle. The outer parts of the star start to fall in on the black hole, but, like most stars, this one is probably rotating slowly. And, just like a figure skater who can spin up to tremendous speeds by drawing in her arms, the slowly-rotating star speeds up to a tremendous rotation of gas falling into a black hole. The black hole can't swallow all of this rotational energy, and it begins to spew material outward in narrow beams moving at nearly the speed of light. These beams of particles burrow out of the star and run into gas and dust in the space surrounding the star, where the violent collisions produce copious amounts of light in the form of gamma rays, X-rays, and even optical light. Meanwhile, what is left of the star continues to collapse under gravity, but the stream of particles from the very center of the collapse causes the implosion to "bounce" outward, ripping the star apart in a cataclysmic supernova explosion. The supernova material moves much slower than the speed of light, so it appears to us on earth only a few days after the gamma ray flash. This model does a nice job explaining everything we know about the long gamma ray bursts. It's not a perfect model, and there are still many holes in our understanding, so it would not be surprising if the true details are quite a bit different. But that is how astronomy often works -- theories are developed to explain an observed phenomenon, those theories make new predictions that can then be tested with new observations, and then the theory is either disproven or shown to be in need of some revision, and the cycle continues. In the meantime, we still have the ever-mysterious short gamma ray bursts (which may be giant star quakes on neutron stars, or colliding neutron stars, or merging black holes, or something even more exotic) to study, and even the long gamma ray bursts continue to surprise us with complexities we never imagined! What's a gamma ray burst? In a couple of posts over the last few weeks (one on the "Death Star Pinwheel" and one on a very bright explosion), I've mentioned gamma ray bursts. But what is a gamma ray burst? Today, a little history, and tomorrow, the current hypothesis. In the 1963, the US and Soviet Union entered into a treaty that prohibited the testing of nuclear weapons in the atmosphere, in outer space, or under water. The US decided that one way to verify that the Soviets were not testing weapons in space was to launch a satellite to look for gamma rays. Gamma rays are the most energetic form of light, and are released in copious quantities by nuclear reactions. The atmosphere blocks gamma rays, so the only way to look for them is in space. So, the US launched a series of Vela satellites to look for short flashes of gamma rays -- and they found them! After a few tense weeks of detecting almost a flash a day, it was realized that the amount of nuclear material the Soviets would have to be using to test so many space weapons would be depleting their entire stockpile, which would not be a smart move, and the Soviets were not dumb. A little more research proved that the explosions were coming from deep space, and so were astronomical. Most people though that gamma ray bursts must be material falling onto neutron stars in our galaxy causing small nuclear explosions. But in the the 1990s, the Compton Gamma Ray Explorer (the gamma-ray equivalent of the Hubble Space Telescope) found that gamma ray bursts do not come from the parts of the sky where the Milky Way galaxy is found -- they come from every direction. That is a strong indication that these gamma ray bursts come from the distant universe, which looks about the same in every direction. But if the events that caused gamma ray bursts sent gamma rays in every direction, the energies required were at least 10 times bigger than supernovae, the most powerful explosions in the Universe. To further muddy the waters, the Compton Gamma Ray Observatory started to reveal evidence that there are two types of gamma ray bursts. One type, the short burst, has higher-energy gamma rays but only lasts a fraction of a second. The second type, or long burst, had lower-energy gamma rays but last ten to 30 seconds. I remember seeing some talks about this data when it was first emerging. Lots of people had lots of ideas as to what gamma rays were, why there might be two different types, and whether or not they actually believed any other theory. But we needed some more information, and that information came from an unexpected source: an Italian X-ray satellite called "Beppo-Sax." When it comes to seeing faint things, our eyes aren't that bad. Yes, some other animals use tricks to be able to see fainter things than we can (like reflective linings to the eyes, or more sensitive rods in the eyeball). But, given time to adjust to the dark, our eyes can see stars when only a dozen or so photons of light are hitting our eyeball every second. That's not too bad! So, how far our unaided see? On a clear, moonless night, most people with decent vision can see the Andromeda Galaxy (Messier 31), and under excellent conditions, many people have been able to pick out the Pinwheel Galaxy (Messier 33, a.k.a. the Triangulum Galaxy. Andromeda is about 2 million light-years away, and the Triangulum Galaxy may be 3 million light-years away. This sounds really far, but, in astronomical terms, they are neighbor galaxies. Andromeda, Triangulum, and the Milky Way galaxies are all part of the "Local Group" of galaxies. The Local Group is kind of like a solar system of galaxies. All the galaxies in the Local Group are bound by gravity and are very slowly orbiting one another. In a few billion years, we may even collide with the Andromeda Galaxy. Some eagle-eyed people looking on pristine nights from mountain-top sites have been able to see Messier 81, a galaxy about 12 million light-years away. Messier 81 is not part of the Local Group of galaxies, but is instead the heavyweight core of the closest group of galaxies outside our own. But this is a little like being able to see the house across the street in a large metropolis -- not too impressive. The most distant galaxies the Hubble Space Telescope can see are a thousand times further away than Messier 81. However, last Wednesday morning, March 19, 2008, humans had a chance to see an event with their own eye that was seven billion light-years away, or halfway across the visible Universe. At 6:12am and 49 seconds Universal Time (2:12 am Eastern Daylight Time), the Swift gamma-ray satellite detected a burst of gamma rays coming from the direction of the constellation Bootes (near the Big Dipper). Robotic telescopes on the ground instantly moved to this portion of the sky, where they found a point that brightened from invisibility to magnitude 5.5 in only 20 seconds. It stayed bright for about 30 seconds, and then started to fade away to the nothing from which it came. For those who don't speak magnitudes, a magnitude of 5.5 is bright enough for the human eye to see on a drak, clear night, but just barely. Later analysis determined that the light these robotic telescopes saw came from a galaxy nearly 7 billion light-years away. The short of the story is that, had you been lucky enough to have been outside, had your eyes adapted to the darkness, and knew where to look, you would have been able to see a faint spot of light coming from a galaxy halfway across the visible Universe last Wednesday morning, but only for about 30 seconds. As far as we know, no human knowingly saw this event -- the "flash" was too faint to notice unless you knew right where to look, and the 30 second time interval was not long enough for anyone to have been able to learn about the gamma ray burst, consult their star charts, look, and be certain what they were seeing. Still, it is exciting to think that, in some circumstances, it might be possible for a human with no equipment other than their eyeball to see something that far away. Gamma ray bursts happen about once a day, and while this is the first burst to have gotten this bright, a flash like this probably happens every few years. We've just never had the technology before. Maybe some day in the next decade or two, someone will get lucky enough to catch a few photons from en explosion that happened billions of years ago with nothing but their eye. We all have experienced sound echoes. Sound waves from an event (preferably loud and short) bounce off of distant walls and travel back to our ears. Because of the finite time it takes sound to travel, we can hear individual echos. Sound echos are used quite often by living beings -- The Navy and fishermen use sonar to find fish (or submarines) under water; bats and dolphins use echolocation to get their food. Light also travels at a finite speed, though much, much faster than sound. Humans have learned to make use of "light echoes" for all sorts of clever things -- we call this radar (for radio waves) or lidar (for laser light). There are some events in space that make nice, short bursts of light, such as supernova explosions or eruptions from the surface of a star. The neat thing (at least to me) is that we are now able to detect these "light echoes" from astronomical sources, as light from the event bounces off of dust or gas and toward the Earth. A press release from the Chandra X-ray Observatory shows one cool example of a light echo detected in the Large Magellanic Cloud (LMC), one of the Milky Way's companion galaxies. About 400 years ago, a supernova exploded. The supernova was probably quite easy to see from the Earth, but I'm not aware of records from it. This wouldn't be too surprising, as the LMC is only visible south of the equator, and there just aren't a lot of written astronomy records from civilizations down under during that time. Anyway, astronomers studying this supernova's remains (an X-ray picture of them is at the top of this blog post; I think it looks like a celestial pufferfish) also looked in optical (visible) light at the area surrounding the supernova, and they found an echo of light from the supernova itself! This page has movies showing the movement of the light echo over a period of five years (be warned, the movies are large. If they are too big for your internet connection, you can look at the individual pictures). Pretty neat! What can we learn from the light echo? First, astronomers have been able to analyze the light from the echo and determine the type of supernova that made the explosion. There are two types of supernova explosions -- those that come from a massive star ending its life, and those that come from white dwarf stars. From the light echo, astronomers were able to confirm that the explosion was from a white dwarf. This knowledge helps us understand the X-ray light the Chandra observatory sees. We can also use the light echos to get a three-dimensional picture of the dust and gas in the region surrounding the supernova. You can see the shape of the echo change slightly from picture to picture in the movie, which tells us that the gas and dust in the LMC galaxy are clumpy. Perhaps astronomy's most famous light echo is from an eruption on the star V838 Monocerotis, shown in this video from the Hubble Space Telescope. Over a period of 4 years, the light from the eruption lit up swirling dust surrounding the star. While the light echo in the LMC pictures is not quite as dramatic, it serves the same purposes! On February 2, Punxsutawney Phil (the groundhog) predicted six more weeks of winter. And, by gum, he was right! It's now six-and-a-half weeks later, and spring has sprung (at least in the northern hemisphere). Today the sun will appear to move north of the equator, where it will stay for the next six months. At the north pole, the sun is rising, and at the south pole, the sun is set (stranding scientists at the South Pole Station until their spring comes). Tomorrow is the full moon. In the Christian tradition, the first Sunday following the first full moon of spring is the Easter holiday (which explains why Easter is so early this year -- the full moon comes only a day after the start of spring). The Easter holiday remains one of the western calendar's few remaining links to lunar calendars (calendars based on the moon's 29-day cycle through its phases). Lunar calendars are still in popular use throughout the world -- the Islamic calendar, Jewish calendar, and Chinese calendar (among numerous others) are all based primarily on the moon's phase. But since the moon's phases don't match up exactly with the solar year (the length of time it takes the Earth to orbit the sun once, and the basis of the Gregorian calendar we use in everyday life), lunar calendars are a bit odd to the uninitiated, requiring the occasional extra month or something similar to bring the two back in line. Astronomer's observations are often based on the lunar cycle. The full moon is very bright -- you will notice that you can see fewer stars in the sky when the moon is almost full as opposed to when the moon is absent from the sky. The faintest stars are hidden by the moon's glare. Even with telescopes, the moon's glare hides fainter objects. So, when we ask for telescope time, we have to specify if we can do our science when the moon is bright. When the moon is bright, astronomers tend to look at bright stars, because their light cuts through the moon's glare. More recently, astronomers also tend to use the full moon time to look at objects in infrared light. Although the moon is still very bright in the infrared, the sky itself is always glowing brightly in the infrared, and the moon's light doesn't add much to the overall glow. (There are also stories of infrared astronomers moving the telescope to their next target and finding the moon is in the way!) But those of us who just want to study faint stars or galaxies in visible light are out of luck near the full moon. So, even as the modern world steers further away from lunar calendars, observational astronomers still have to pay close attention to the phases of the moon. This afternoon, NASA announced that the Hubble Space Telescope detected organic molecules in the atmosphere of a planet circling another star. First, let me emphasize: Hubble did not discover evidence of life on another planet. Organic molecules (generally molecules made mostly or fully of carbon and hydrogen atoms) are quite common in the Universe. Carbon is made in stars and during supernova explosions, and is one of the most abundant atoms after hydrogen and helium. And the organic molecule found, methane, is quite common in the atmospheres of Jupiter, Saturn, Uranus, Neptune, Saturn's moon Titan, and even in some of the coolest brown dwarf stars. So, why the big deal? It is because we are detecting the signatures of chemistry on a planet outside of our solar system. We can now begin to probe the chemical make-up of this planet, and from that begin to test our models of giant planets around other stars. How did Hubble detect the methane (and water) in this planet? The planet in question, which has the extraordinarily boring name of "HD 189733b", is about 63 light-years away toward the constellation Vulpecula, a tiny, forgettable constellation near Cygnus, the Swan, visible during the summer months in the northern hemisphere. The planet is about the size of Jupiter but is located very close to its parent star, completing an orbit in only 2 days. Compare that to 88 days for Mercury to go around the sun, a year for the Earth, or 12 years for Jupiter! So it is a hellishly hot place, and certainly nothing can live on the planet (which is a big gas bag, like Jupiter), or on one of its moons (if it has any). The planet passes in front of its parent star, as seen from the Earth, once each orbit. Every two days or so, the star appears to get a little fainter as the planet's shadow crosses the face of the star. The planet only blocks out some of the star's light (about 1%), so these little variations are hard to see. Some of the light from the star passes through the planet's atmosphere on its way to Earth, and any chemicals in the planet's atmosphere will put a fingerprint on that light. This is a very tiny signal, and very hard to see. But, with time, patience, and a lot of hard work, it can be picked out. In the past, astronomers had detected sodium in the atmospheres of a few planets around other stars. Now, we can add methane and water to that list. The next step is to compare the various chemicals and the amount of those chemicals that we see with theoretical models of what these planets atmosphere's might look like. These models are really just educated guesses -- if we assume the planets are like Jupiter, and have a chemical makeup similar to that of their parent star, and we make some guesses as to how hot the planet might be, we can use concepts of meteorology and chemistry to calculate what the planet's atmosphere should look like. And the very early indications are that the models aren't quite right. The models predict that water and methane and sodium should be there, but in different amounts. This disagreement is a good thing -- it means we don't yet know everything, and that we can learn a lot by doing more studies like this one. So, congratulations to the team who made this discovery. Good going -- now, let's get back to work and see what more we can learn about these planets! While most people don't like watching TV reruns, most of us have a few shows that we will stop to watch if they come on. My parents had a favorite episode of M*A*S*H, "5 O'Clock Charlie," that they loved to watch and recount. I have a few favorite movies, like Airplane!, that I love to watch over and over, because I often catch something new. And my daughter is just a few years past the phase when she would shout "again!" from the back seat of the car, her request to replay her favorite song from the CD we'd be playing. In the world of astronomy, information and research is often conveyed by hour-long talks ("colloquia"). But it is extraordinarily rare to hear a "re-run;" with several thousand astronomers to choose from and only one or two colloquia a week, why should the department spend money to bring back a scientist to give the same talk she gave just a year before? But, like with entertainment, we often can get more out of hearing a talk for a second or a third time. Today, I had the lucky opportunity to get an astronomy colloquium re-run. We had a speaker here at Texas that I saw a couple of years ago at the University of Arizona. Hal Levison is an astronomer at the Southwest Research Institute in Boulder, Colorado. He studies planetary system dynamics (this means he studies how planets, asteroids and comets move in solar systems). And he was talking about the history of our own Solar System. When we look at our Solar System, we see a nice, ordered structure. Four rocky planets, an asteroid belt, four big gassy planets, and a belt of icy asteroids. If you put the Solar System in a computer and see what will happen a billion years from now, you'll see that the Solar System will look about the same. Maybe a few asteroids have hit some planets, and some comets have come and gone. But Earth will still be in the same orbit; Mars won't suddenly go veering off into deep space. Has our Solar System always been this way? Detailed studies of asteroids and the icy Kuiper Belt Objects (like Pluto and its family) suggest not -- they suggest that the big planets have moved around. And the moon shows scars from what was a surge of impacts about 3.9 billion years ago. What happened? Levison and his collaborators took a wild guess, and then tested it with computer models. They guessed that, 4 billion years ago, Saturn, Uranus and Neptune were much closer to the sun than they are now, and fairly close to the planet Jupiter. 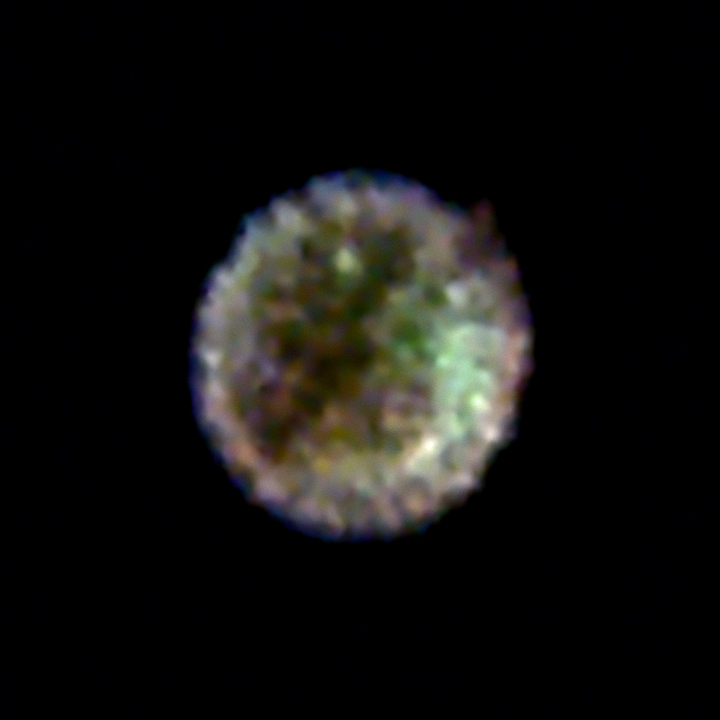 And they guessed that, outside of Neptune, there were thousands upon thousands of Pluto-sized and smaller icy bodies. And then they let the computers do their thing. Eventually, Saturn and Jupiter get to a state called resonance, where Saturn goes around the sun once for every two times Jupiter orbits. In physics, resonance is a special thing -- you get feedback. Just like a small whine picked up by a microphone can feed back and give you a piercingly loud noise, the resonance of Saturn with Jupiter started tossing Uranus and Neptune around the outer Solar System. The ensuing chaos of giant planets rumbling through the thick belt of icy Plutos sent rocks and comets and ice everywhere -- deep into space, into the Earth and Moon, into the sun -- everywhere. And then, as quickly as it started, Jupiter and Saturn moved out of resonance, and everything settled down. Uranus and Neptune survived, but were much further from the sun, and 99% of the icy belt that had been the outer Solar System was lost to deep space. In fact, the Solar System looked just like it does today -- nothing has happened since then. This is a neat idea that explains lots of things we don't understand about the makeup of our Solar System. And so it was nice to see it a second time. Some ideas were clarified in my mind, some things I mis-heard last time I caught this time, and a few new ideas were introduced. And I learned where there are still some things to be explained and some interesting avenues of future research. Maybe 5 years from now we'll find that this idea just doesn't work. Or maybe it will be confirmed. I'll await the next re-run to see. Image Credit: Speed Measurement Laboratories Inc. This weekend I worked on trying to measure how fast a certain star was moving. It didn't go very well. It's an interesting star (a white dwarf with a very strong magnetic field that is pulling gas off of a companion star), and I found the star by accident in some data I took a year ago. Because it was a serendipitous discovery (meaning I was looking for something else), I didn't get quite the right measurements, and I'm trying to kludge something together. You will often hear about astronomers measuring how fast an object is moving. We detect planets around other stars by measuring changes in the star's speed caused by the planet's gravity. We know that the Universe is expanding because all distant galaxies seem to be moving away from us, at faster and faster speeds the further we look. How do we measure speeds of stars and galaxies? Astronomers use a technique called the Doppler Effect. The one sentence summary of the Doppler Effect in astronomy is that an object's movement slightly changes the wavelength (or "color") of light coming from that object. A police radar gun uses the Doppler Effect. The radar gun sends out radio waves with a wavelength of about 1/3 of an inch (or a little less than 1 cm). The radio waves bounce off your car, and the car's motion causes the wavelength to change a little bit. The radar gun measures the change, and calculates the speed of the car. And, as long as the police officer has remembered to calibrate the radar gun (by pointing it at something that isn't moving; many radar guns do this automatically now), the measurement is pretty accurate. The only difference with measuring the speed of astronomical objects, like stars and galaxies, is that we don't send out a light beam to bounce off of the star. That would take decades to millions of years to get a measurement! And, it's not needed, since stars and galaxies put out their own light. Another small difference is that astronomers tend to use optical wavelengths of light, which are only the size of a bacterium, and it's much harder to measure the differences in that wavelength than the radar wavelengths of a third of an inch. But, like the police officer, we have to make sure to get proper calibrations. Astronomers use several different calibrations. We have lamps that emit light at only very certain wavelengths, and we know those lamps are not moving. We can use Earth's own atmosphere, which glows faintly at very specific wavelengths, as a double-check. And, to triple-check the measured speeds, we look at stars with known and well-measured speeds. Astronomers looking for planets sometimes even use a fourth level of calibration, by making the starlight to pass through a container of iodine gas (which absorbs light at many very specific and unchanging wavelengths). My problem: I wasn't out to measure the speeds of stars when I took my data. So, while I did use the lamps I talked about above. At the certain colors of light I was looking at, the atmosphere doesn't glow. I didn't look at a star of a known speed (I didn't think I'd be needing that information!). And, since I wasn't looking for planets, the container of iodine stayed safely stored. So, I have some very accurate measurements of changes in the star's speed during a single night, because I can inter-compare all the data I took. But I don't know the absolute speed. (It'd be like a police officer measuring that you slowed down by 15 miles per hour once you saw the cop car, but the officer not knowing if you were ever actually over the speed limit). Yes, I could go back to the telescope and get a new and proper look at this star, but I need to try and make do with the information I have first. I have a few more tricks to try, too. We'll see what happens. It's spring break in Texas. The University, primary and secondary public schools are on break. So, where are most of us astronomers spending our vacations? Are we on the beaches of the Texas Gulf Coast? Or jetting off to Mexico, tropical islands, or other exotic locales? For most of us, no. We are enjoying the quiet week here on campus. No meetings, no classes, no need to time trips to campus to avoid class changes, plenty of parking. Why fight throngs of students on South Padre Island when I can walk to my favorite lunch locale without waiting for a seat? Or why sit in traffic trying to drive to the coast when the Austin freeways actually move near the limit at rush hour? Academic life seems to involve a love-hate relationship with the students we are here to serve. Salaries are supported by the tuition of the students in the classes we teach, and most astronomers enjoy teaching and spreading the excitement of what we do. But it does get to be a drain when we have to squeeze onto a bus with young people carrying backpacks that smash into our faces, when we squeeze into an elevator with students who feel the need to ride up one floor, or when half our class is busy texting during a lecture we've taken hours to prepare (and these same students complain afterwards that material on the exam was not covered in class). So, we enjoy these quiet weeks as vacations: time to reconnect with our research work and our love for the science. And, when tanned students come back next week and start complaining that they did their homework over Spring Break but forgot it at home (yeah, right! ), hopefully our batteries will be recharged. Astronomers (or at least the press who cover space news) seem to like the phrase "death star." I think of several reasons for this: it reminds everyone of Star Wars, and plays a little on our inherent paranoia: everything in space is out to get us. A few months ago, I blogged about the Death Star Galaxy. And now, we have a news story about the "Real" Death Star. No, Darth Vader is not out to get us (that we know of). So, what is out to get us this time? The scientific research is about a pair of stars known as "Wolf Rayet 104." Wolf-Rayet stars started life dozens of times more massive than the sun; they are so bright that the outer layers of the star are spewed back into space. In just a few million years, the stars may have lost 75% of their matter this way, and they've burned through their entire supply of fuel. These stars are very close (within a few hundred thousand years) of a supernova explosion. There are many reasons to think that Wolf Rayet stars may be one of the sources of mysterious "gamma ray bursts," very energetic jets of gamma rays that we can see in galaxies most of the way across the visible Universe. These jets of gamma rays are created as material falls into a black hole formed by the collapse of the star, which releases tremendous amounts of energy. Wolf-Rayet 104 is a pair of these stars, and so are supernovae waiting to happen. The stars are about 8000 light years away in the constellation Sagittarius. They are invisible to the unaided eye, but are located just north of the spout of the teapot shape of Sagittarius. The movie above shows a real infrared picture of the star system. Astronomer Peter Tuthill of the University of Sydney and collaborators used the Keck Telescope in Hawaii to take pictures in infrared light. What you are seeing is dust thrown off in the strong winds from these stars; the orbits of the stars around each other cause the dust to twist into a spiral pattern. Tuthill and collaborators have been working on this star system for years, and are using the stars to measure the amount of matter the stars are spewing into space and how the winds from each star are colliding, helping to produce the dust that they see. But they also noticed from the nearly-circular shape of the spiral that we are looking at the south pole of the star system. If, when this star explodes, it produces a gamma ray burst, the gamma rays are likely to come out of the stars' north and south poles. In other words, nearly straight at us. If a nearby gamma ray burst were to happen, it is possible that the Earth would suffer. Gamma rays are really energetic, and while our atmosphere protects us from the gamma rays normally streaming through space, it might be overwhelmed from the large amounts of gamma rays a nearby gamma ray burst would produce. And that could be bad for the Earth and our ecosystem. Some of the dire forecasts some astronomers have made are mass extinctions, collapse of the food change, horrible mutations from the flux of radiation, and other very bad things. I'm not too worried about this right now. First, the chances of these stars exploding anytime soon are small -- maybe 1 in 100,000 every year. Second, we don't know for certain if either of these stars will make a gamma ray burst and, if they do, whether it will be pointed exactly at us. When it comes to gamma rays, it has to be a direct hit to cause the damage -- a near miss doesn't count. But even more, when you look at the fossil record, there are very few mass extinctions, and most of these have other explanations. The dinosaurs died when an asteroid hit the Earth. The Permian extinction, which killed 96% of species in the oceans and 70% of those on land, seems to be associated with massive outpourings of lava (although this is still quite disputed). And some biologists claim we are currently in a mass-extinction event driven by humans. There is little evidence for a mass extinction event caused by a gamma ray burst in the past (though maybe we have mis-interpreted the evidence). I think we should definitely keep studying Wolf-Rayet 104, and I think there is a lot to learn about dying stars from this pair of stars. But I will not lose any sleep over the supposed danger these stars might pose to Earth. Today, optical and ultraviolet astronomers around the world are scrambling to finish proposals for the Hubble Space Telescope. Tonight, at 8pm Eastern Time, proposals are due for the Hubble's 17th Cycle (each cycle is roughly a year) of operation. This time around, there are two new instruments that astronomers hope to use, if the Space Shuttle's servicing mission works as planned. One is a spectrograph for analyzing ultraviolet light, that high-energy light that can be harmful to humans, but which contains a wealth of information about stars and distant galaxies. This spectrograph is called the "Cosmic Origins Spectrograph," because it will be useful for interpreting light from the earliest galaxies. More to the point, the light that we detect on Earth from the earliest galaxies is ultraviolet light that the expansion of the Universe has stretched into visible and optical light. So the Hubble's spectrograph will be used to explore more nearby galaxies (where we think we understand what is going on), and that information used to interpret the light from more distant galaxies. Another new instrument will be a new imaging camera, more sensitive than the current one on Hubble. Like other cameras, this one will be able to take pictures in ultraviolet and visible light for studies of just about anything. So, although these cameras are still on Earth, waiting to be launched by the space shuttle, we are starting preparations to use the cameras. It takes months for people to sort through the hundreds of proposed projects, select the very best ones (and some back-up plans in case one of the instruments fails or repairs don't work), and plan out an observing schedule. By the time that is done, we hope that the space shuttle will have safely traveled to Hubble and gotten back in tip-top shape. Still, it is a little nerve-wracking to write proposals for broken cameras that we hope to fix, but may not get fixed, or for cameras that are not yet there and may not function exactly as advertised. And, since each proposal takes a lot of time if you want to do it properly, we hope that we are not wasting that time. It is rare in astronomy to work on objects that change. Most stars will look the same in ten years as they do now, and will be in the same place. The surface of the moon changes so slowly that Apollo astronaut footprints probably still look as if they were made yesterday, not 40 years ago. Some items do change in short timescales -- supernova explosions appear and disappear on timescales of weeks or months, comets come and go, the clouds of Jupiter are constantly changing. Mars is one of those objects that tends to change slowly. The polar ice caps come and go in a Martian year (about two Earth-years), and dust storms come and go in the Martian summer. But, otherwise, the surface changes on timescales of millions of years. Sometimes, however, we are surprised. The pictures above were taken by the Mars Reconnaissance Orbiter (MRO), a robotic space probe in orbit around Mars. The pictures are part of a study to observe how Mars's polar ice caps change through the seasons. Mars has ice caps, like the Earth, only Mars's ice caps contain both water ice and carbon dioxide ice ("dry ice"). When this picture was taken, it was spring on the north pole, so scientists wanted to see what happened as the ice caps melted (more precisely, they sublimate, turning straight from ice into gas). What you see in the picture is the carbon dioxide ice (brighter white) on top of some dusty water ice (the light red colors) and what is probably a permafrost mix of ice and rock (dark colors). The edges are a cliff over 2000 feet high. And, in the middle, you see the dust from an avalanche that happened just as the picture was taken. First and foremost, I find the picture cool. 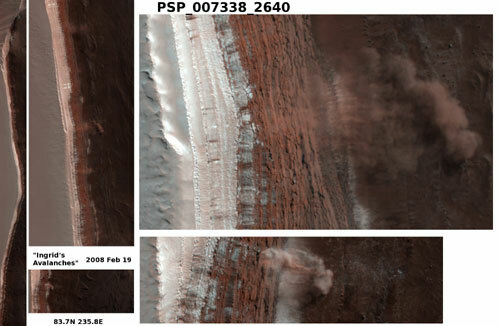 Who would've thought we'd ever take pictures of avalanches on Mars? But there is some science we can learn, too. Since these pictures were taken at random, and not as part of a long time series, we know that the avalanches must be common. Why? Because if the avalanches were rare, the chances of seeing one in a single picture would be very small. The chances of seeing four in separate pictures would be even smaller. Imagine you are driving across the country, taking pictures every few minutes. You wouldn't be surprised that lots of your pictures have telephone poles, because telephone poles are very common. But what are the chances that one of your pictures would contain a penguin? Very small -- the number of loose penguins in the Northern Hemisphere is tiny, if not zero. So, suppose you were driving past Chicago and four of your pictures had penguins. You would instantly know that there must be a lot of penguins in Chicago -- your next step would be to figure out why. And that is the next step for the Mars avalanche researchers. Why are avalanches so common? Do those avalanches greatly change the rocky landscape, or are they mostly ice, and so they evaporate in the Martian spring and leave no trace behind? Tomorrow, (Wednesday March 5), people across much of the midwestern and southern United States have the chance to see the moon pass in front of the planet Venus in broad daylight. If you have binoculars, seeing this event will be fairly easy, but if you are patient and lucky, you may be should be able to see the moon and Venus in the daytime with just your eyes. The planet Venus is usually bright enough to see in plain daylight (as are the other bright planets and, some claim, the brightest stars). The reason most people never see the planets during the day is that your eyes are fooled by the sky. If you look at a blank sky, your eyes tend to focus at a spot about ten feet away from your face, which puts any planets and stars in the sky out of focus, making them impossible to see against the bright blue sky. But if you know where to look and can focus your eyes properly, Venus is quite easy to see against the sky! The trick with tomorrow's event will be finding the moon in the sky. The moon will be about 25 degrees away from the sun -- that's only a little more than the width of your stretched hand (from pinky tip to thumbtip) at arm's length. The moon will also be very hard to see, because it will be a very skinny crescent. To see the moon without hurting your eyes due to the sun, you'll need to hide stand in a shadow. And, the moon will be between the sun and the horizon, so a building shadow will likely hide the moon, as well. You'll need a tree branch or lamppost or some other well-placed shadow. An occultation means that the Moon will pass between Venus and the observer, so this is sort of like an eclipse of Venus. Venus will be behind the moon for over an hour in most places, so if you look during the occultion, you'll just see a crescent moon (like in the picture above, only even skinnier). Whoop-di-doo. No, the best views are either just before or just after the occultation, when you can see the moon and the brilliant light of Venus right next to it. What time should you look? It depends where you live. Here is a website with a map and times of the start and end of the occultation. The times are in 24-hour format (e.g., 20:00 = 8:00pm), and in Universal Time (UT). Eastern Standard Time is the UT time minus five hours; so if the occultation starts at 20:25 UT, it starts at 15:25 EST (which is 3:25pm). Likewise, Central Standard time is the UT time minus six hours, and Mountain time is UT time minus seven hours. The moon will be really, really hard to see without binoculars, because it will be very skinny. If you want to use binoculars, be very, very careful to make sure you don't point them anywhere close to the sun. Looking at the sun, even accidentally, through binoculars will instantly and permanently damage your eyes! So, in short, if you have clear skies tomorrow afternoon and want a challenge, try going outside to see Venus and the moon in broad daylight. They will be hard to find, but seeing both in the daytime sky is something you'll remember for a long time to come! For more information, read href="http://www.skyandtelescope.com/observing/highlights/16079237.html"Sky and Telescope's article on the occultation. Good luck! (1) I was listening to the radio today, and a commercial for Comcast came on. The commercial was lauding people with genius ideas (such as buying their product), and it referred to Galileo's proving that the "Sun is the center of our galaxy." WRONG!!! The Sun is not the center of our Galaxy. The center of our galaxy is actually a black hole a million times more massive than the sun (not a fun place to be) and about 25,000 light-years away. The Sun is the center of our Solar System (the sun, eight planets, dwarf planets, asteroids, and comets). This sort of mistake is the kind I get upset over, because it is so easy for the ad agency to actually check the facts -- two minutes with Google and Wikipedia would give the right answer. Shame on you! (2) As I was getting some coffee at Kitt Peak this afternoon, I heard a visitor remark how horribly boring it would be to stare at the same star for his entire life. Well, this isn't what astronomers do. We look at many (if not millions) of stars, or even at other galaxies, which are conglomerations of tens of billions of stars. But this mistake is forgivable -- it is a person with a misunderstanding about what we astronomers do. And that's part of my reason for doing this blog, to try and clear up that understanding. Since my readership is slightly under 6.5 billion people, I obviously have some more work to do to reach everyone. (3) As I was sleeping this morning, a bunch of teenagers walked past the astronomer's dorm (where there are signs saying "Quiet, Day Sleepers"), and started yelling. Too bad I'm not in Texas, as taking care of that situation would have constituted justifiable homicide. But, instead, I had to seethe on my pillow until the gang walked past, and then I went back to sleep.